The layers on this chicken sandwich are HEAVENLY. 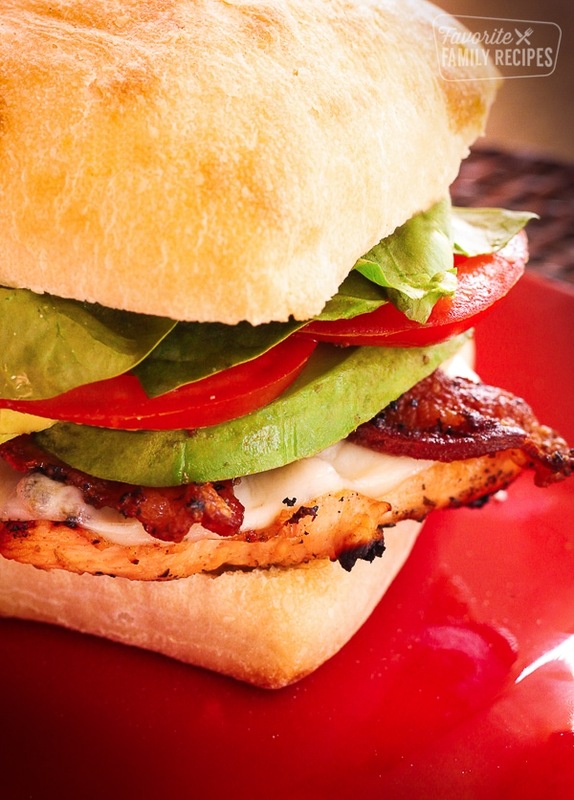 You’ve got your grilled chicken, your gooey cheese, crispy bacon, smooth avocado, juicy tomatoes, and crisp lettuce between two soft ciabatta buns and slathered with a tangy aioli mayo.. seriously, what’s NOT to love here? If you are serving these with ciabatta bread, be sure it is pretty soft. You can cut the bread open, butter lightly, and place on the grill to crisp up a little bit, but still have that delicious softness inside. When preparing the chicken, place the chicken breasts in a Ziploc bag and pound flat (no too much because you don’t want the chicken to tear). You just want even thickness so it will cook evenly on the grill.If you want to be ambitious with the bacon, feel free to cook it up on the grill (or even wrap the chicken in it). If you are doing it on the grill, I suggest wrapping it in paper towels and zapping the in microwave for just 30-seconds – 1 minute to get some of the grease off. This will prevent excess grease from getting into your grill and causing flames to rise and burn your bacon. Keep an eye on it closely because bacon tends to burn extra quickly on the grill! Pound chicken breasts flat and place in plastic Ziploc bag. Combine marinade ingredients and add to chicken. Seal bag (pressing as much air out as you can) and marinade in refrigerator for at least an hour. In the meantime, pan-fry bacon until most of the grease is cooked off but not completely cooked through. Remove from pan and place on paper towels to soak up grease. Remove chicken from marinade (discard marinade) and grill over medium heat until cooked through. Top chicken with cheese and remove once cheese is melted. Add bacon to grill while chicken is cooking-- watch the bacon closely so it doesn't burn. Once the bacon is nice and crispy, remove from grill. Combine Spicy Aioli Mayonnaise ingredients and spread over toasted ciabatta rolls. Add chicken and bacon to each roll and top with remaining ingredients. This was amazing!!! I did not have bacon so I left that out but it would have been even more amazing if I had used it. I changed it just a little. I used lite mayo so it would be a little healthier and I didn’t have the dressing in the pouch so I used light italian dressing. Thank you and my husband loved it. Love hot chicken ciabetta, so handy for a snack. I used all the regular bacon by mistake this morning, so I’ll have to use natural bacon pieces/bits and put it in the sauce. Hopefully it works for the flavor to balance out! What is siracha sauce? Where can I buy it? It is a hot sauce that can be found at any whole foods or just about every health food store… Probably most grocery stores as well. Comes in a yellow and red bottle. I didn’t follow the whole recipe because I was just looking for a quick fix for my boring chicken sandwich idea. All I had was chicken marsala, tomatoes, muenster cheese and baby spinach. It turned out great! I love the spicey sauce as well, it made my hungry fiancé and I happy and full! I’m so glad it was a success! Thanks for sharing! The guys at the fire station LOVED these and said they were the best chicken sandwiches they ever had. Thanks! Wow! That is awesome! Thank you for sharing! Made these for a picnic lunch at the apple orchard/winery. They were so delicious and everyone raved! Big Hit! thanks!!! Love, love, love the spicy mayo recipe! I will use on more than just chicken (altho I did use tonight for this recipe of chicken sandwiches)…so good! I’m making it now …so far so good! This sandwich was amazing!! The spicy mayo is now a condiment I have on hand all the time now. Thank you for this recipe! YUM! I just found this recipe, making tonight for dinner. Using romaine lettuce instead of spinach bc I like the crunchy texture. Serving with broccoli n cheese soup. Something different for dinner love it! Oh yum! That sounds like a tasty combination! Let us know how you liked it!